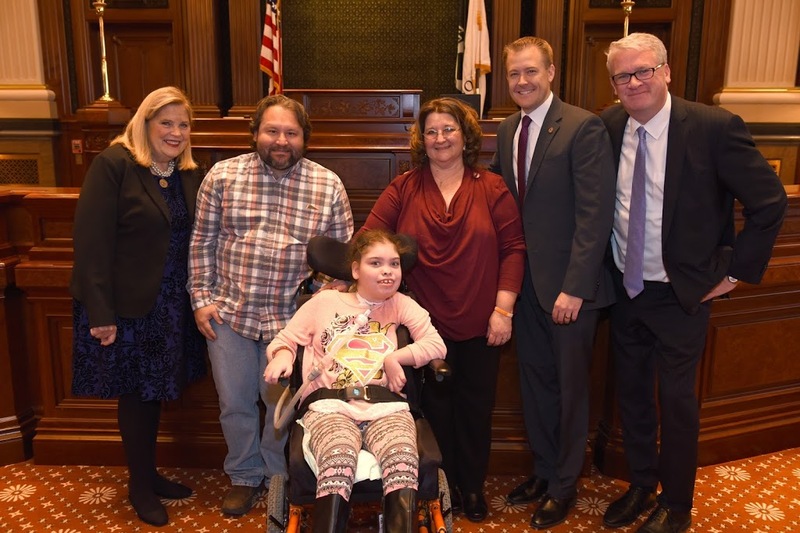 SPRINGFIELD, IL…Tess Drainer has Bilateral Perisylvian Polymicrogyria (BPP), but that did not stop her from visiting Representative C.D. Davidsmeyer (R-Jacksonville) at the IL State Capitol this week. Rep. Davidsmeyer passed House Resolution 1075 in 2016 to honor Tess for her work spreading awareness of BPP. Tess came to Springfield with her mom and uncle to bring awareness to BPP, a rare disease. Her smile provided a bright spot for the IL House of Representatives. The U.S. Department of Health and Human Services and the Genetic and Rare Diseases Information Center describe BPP as “a rare neurological disorder that affects the cerebral cortex (the outer surface of the brain).” There is no cure for BPP, but that has not stopped Tess from promoting the need for awareness.